Our answer was a custom web application. Zee Designs would take a look at the data already there, analyze what additional types of information would be added or displayed, and design better ways to configure the website search function. There would have to be an easy and secure way for the company to administer updates for existing entries and data entry for new ones. The database would tie into the website’s Talent page so that when the database changed, it would be reflected in automatic updates of new and featured artists to reflect the changes. Although this would be a separate web application, it would have the same look and feel as the regular site and act like part of the website. Visitors to the app would be able to create accounts and automatically send artists selected from their search to Steve Beyer Productions. The end product was a colorful interactive web application that allows visitors to the site to do an interactive search with a variety of filtering options to make it easier to find just the right talent. 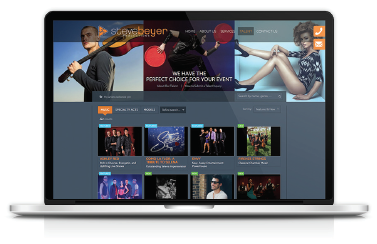 Visitors can take the searching activity to the next level by creating an account with a login, doing their searches, marking the artists they’d like more information about, and sending the artist information along with event information via an email form directly to Steve Beyer Productions. After sending the information, visitors can wait for one of the staff to get back to them, or call in and the agent will have all the information about the artists they are interested in right in front of them so they can answer questions more efficiently. The individual pages for the artists combine the text, photos, and video in a sophisticated way. 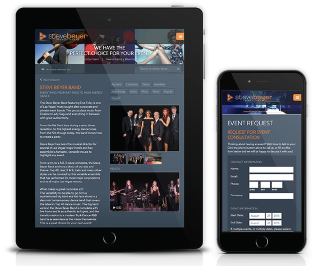 Mobile friendly and responsive screen design. Freestyle text name, labels, styles, etc. The new Talent Showcase offers a flexibility and sophistication that will delight the visitor while helping them find talent efficiently, and at the same time making administration and customer service easy. The website style and branding carries throughout in a beautiful way.